Protein — You deserve a protein shake made for YOU! There are literally hundreds of men’s protein shakes on the market, and they’re loaded with sugar, calories, and other ingredients that do nothing for you. 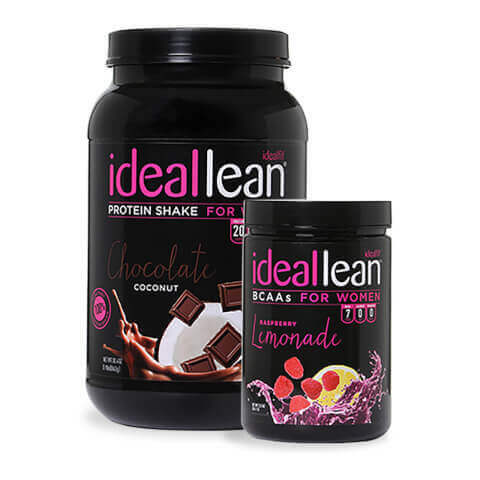 IdealLean Protein has just 80 deliciously smooth calories and 20 grams of whey protein isolate, so you can fuel your body right! BCAAs — If you’re serious about improving muscle recovery, building lean muscle, and burning fat, the last thing you want is to reach for a men’s supplement packed with a bunch of calories and sugar to refuel after training. IdealLean BCAAs is specifically designed to maximize women’s weight loss and jumpstart lean muscle growth! Each serving of IdealLean BCAAs offers 5 g of BCAAs to reduce muscle soreness and promote muscle building -all without any sugar or calories! The chocolate brownie protein is by far my favorite! Blend it with ice and peanut butter & it’s super creamy! Nothing more refreshing than Raspberry Lemonade BCAA during the day and during a workout! I am in love with this stack & will be ordering again! Lol 😂 my husband loves them as well! I need to make an extra shake because I know he will ask for some!